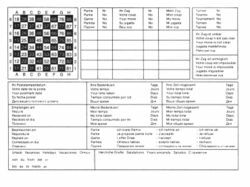 ICCF numeric notation is the official chess game notation for all International Correspondence Chess Federation games. This is because in international correspondence chess the use of algebraic notation may cause confusion, since different languages have different names (and therefore different initials) for the pieces. In brief, each square of the chessboard has a two-digit designation. The first digit is the number of the file, from left to right from White's point of view. The second digit is the rank from the edge near White to the other edge. Moves are designated by giving four digits - the first two are the code for the square of the piece that is moving and the last two are the code for its destination square (Just & Burg 2003:221-22). In numeric notation all the squares are numbered with a two-digit number. In this simple coordinate system the first digit describes the file and the second one the rank. A move is defined by pairing two of these two-digit coordinates together: the move that would be written 1. e4 in algebraic notation would be written 1. 5254 in numeric notation. The pawn starts from square (5,2) (file 5, rank 2) and moves to (5,4). Neither the type of the moving piece nor captures are specifically marked in Numeric notation - all moves, except for pawn promotion, consist of only four digits. In pawn promotion a fifth digit must be added: "1" for queen, "2" for rook, "3" for bishop and "4" for knight. For instance in the case of a pawn on f7 moving to f8 and promoting to a rook would be 67682. A four digit notation where the ending rank is omitted (because it is always "8" for White and "1" for Black) can also be seen: 6762. However, this is confusing and against the standard. For castling, the king start position and end position are recorded: for white, 5131 (queenside) and 5171 (kingside); for black, 5838 (queenside) and 5878 (kingside). The system was devised about 1803 by German professor J. W. D. Wildt of Göttingen. It was used 25 years later by Johann Koch, and is sometimes named after him. Ivan Savenkov supported its use in 1877 and it bears his name in Russia.